With the Pennsylvania Democratic primary being two days away, Sens. Barack Obama (D-Ill.) and Hillary Clinton (D-N.Y.) have been scouring for votes in key areas. Harrisburg was no exception. Obama held the town hall meeting on March 30 at The Forum, Harrisburg (He returned to downtown Harrisburg April 19, 2008, and spoke outside at the Capitol). Before the senator went on stage at The Forum, a pumped up college student began cheering. The crowd followed by shouting “yes we can (a slogan from Obama’s campaign)” and “O-bam-a!” A large American flag hung gracefully while facing the stage on the left side of auditorium. Sen. Bob Casey (D-Pa.), who has endorsed Obama, helped to introduce the presidential candidate at the town hall meeting. “I believe the people want something different,” Obama affirmed. “They want straight talk.” Obama, 46, addressed the five-year anniversary of the Iraq war and the 4,000 lives lost since its inception. “Even after I’m elected president, we’ll have a lot to do,” he said. If appointed, he plans to withdraw most troops within 16 months. He would keep some troops in Iraq to protect the embassy and diplomats. The senator also highlighted the country’s rising foreclosures. He told the audience that he blames some banks and predatory lenders. How would Obama curb this problem? He hopes to create a fund to help homeowners avoid foreclosures. 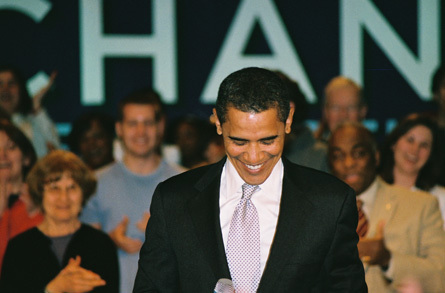 In Vibe magazine’s September 2007 issue, Obama said, “rap is reflective of the culture of the inner city, with its problems, but also its potential, its energy, its challenges to the status quo.” Like Sen. Bob Casey, members of the rap community (including rap tycoon Russell Simmons) have been giving Obama props. Even actor Michael Kenneth Williams of HBO’s “The Wire” attended the town hall meeting in Harrisburg. Williams played Omar on “The Wire,” a series that covers the plight of the inner city.